Dr. Leah Matthews from the Distance Education Accrediting Commission addressed graduates. 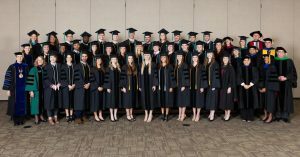 Austin, TX—January 5, 2015—More than 30 Doctor of Physical Therapy graduates from 13 states celebrated their commencement from the University of St. Augustine for Health Sciences on Dec. 12. This was the first class to graduate from the southwest Austin campus, which opened in 2012. Dr. Leah Matthews, executive director of the Distance Education Accrediting Commission, was the guest speaker. “Our graduates are well-prepared to practice as effective, interdisciplinary problem-solvers and leaders in their professions,” said Dr. Wanda Nitsch, USA’s president and chief academic officer. Austin Kocchi received The Stanley V. Paris and Catherine E. Patla Award for Excellence in Manual Therapy. Travis Houser received the Outstanding Physical Therapy Student Award for professionalism, clinical reasoning, ethical standards and commitment to professional growth. Logan Waddell received the scholastic achievement award for the best cumulative grade point average. Before joining the Distance Education Accrediting Commission, Dr. Matthews was a vice president at the Council for Higher Education Accreditation and on the staff of the Accrediting Commission of Career Schools and Colleges. She earned her PhD in Education from George Mason University and a Master of Public Administration via distance education from the University of Oklahoma while working as a civilian for the U.S. Army in Japan. The University of St. Augustine for Health Sciences (USA) is a graduate institution that emphasizes health science education through innovative quality classroom and distance education. Founded in 1979, USA has locations in San Marcos, California; St. Augustine, Florida; and Austin, Texas. USA offers degree programs in physical therapy, occupational therapy, athletic training, education and health science, as well as residency, fellowship and continuing education programs. It is a member of Laureate International Universities, a network of more than 80 institutions in 29 countries and one of the most significant global higher education providers for health sciences. For more information, visit www.usa.edu.